This irresistible list book from National Geographic provides lighthearted quick hits of inspiration for those of us who feel overwhelmed—which is to say, all of us. Musings, activity suggestions, and illuminating quotes are paired with whimsical art on themes such as living in the moment, achieving balance, relieving stress, developing patience, and appreciating the world around us. “Slow living” sidebars, such as “Foods to Cook Slowly” and “Things to Do the Old-Fashioned Way,” are interspersed throughout the book. 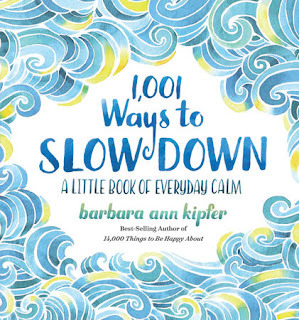 1,001 Ways to Slow Down is a delight from start to finish. First, this is a beautifully designed book. It is a small hardcover with a blue and green abstract design that looks like ocean waves on the dustjacket. The illustrations through the book, by Francesca Springolo, are also lovely. They brighten the edges of the pages and also provide colorful borders for inspiring quotes. In the introduction to the book, Barbara Ann Kipfer writes: "Since sixth grade, I have been an ethnographer, making lists of the little things in life." Although I did not know the term ethnographer before, I am also a lifelong list maker, and this book of lists fills me with delight. "Instead of getting agitated when you are stuck in traffic, think of this as a time to pause - a time when you cannot hurry" (p. 11). "Create a jigsaw or word-search puzzle and send it to a friend" (p. 14). "Walk like a three year old exploring the world" (p. 36). "Put a note in a bottle and send it down a waterway" (p. 196). As you can see from these examples, the suggestions in this book go beyond merely slowing down; they also are tips for finding joy in small, simple things. If you have an interest in mindfulness or voluntary simplicity, or if you simply want to slow down and enjoy life more, you will love 1,001 Ways to Slow Down! I know I did. Dr. Barbara Ann Kipfer is the author of 14,000 Things to Be Happy About and the Page-a-Day calendars based on it. She has written more than 60 books, including 1,001 Ways to Live Wild, The Order of Things, Self-Meditation, Instant Karma, 8,789 Words of Wisdom, The Wish List, and 4,000 Questions for Getting to Know Anyone and Everyone, and she edited Roget’s International Thesaurus. She holds PhDs in linguistics, archaeology, and Buddhist studies. Dr. Kipfer is the Chief Lexicographer of Temnos and has worked for such companies as Answers.com, Ask Jeeves, and Dictionary.com. Lists are some of my favorite things as well. Very comforting! That's a great connection -- slowing down and mindfulness. And what great suggestions you pulled! The idea to look at traffic differently is a great suggestion!